This is a good thriller for those who like detailed stories based on multiple nations and with a fairly wide cast of characters. Nathalie Thompson is a film director for a small documentary maker, Bagatelle Films. 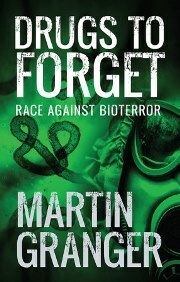 While working on an idea about bio terrorism, she meets a scientist working for a major new corporation who gives her some clues about his own company and products they are developing for a cure for Alzheimer’s. While she is interviewing him and others for the film, there is a bomb attack in Africa, targeting an embassy in Zimbabwe. Meanwhile, a new researcher is recruited to Bagatelle, Tom Finch. He has a degree in biochemistry, and has been hired in order to help Nathalie to work her way through the details of the story. Tom is enthusiastic about his new job, and keen to become involved in film making. He sees it as a glorious life, with foreign travel and visits to exotic locations. And he soon feels his enthusiasm is being rewarded, as he boards a plane for Indonesia. Nathalie has found a collaborator in Zimbabwe, a reporter called Lloyd, who can help her find a way into a shadowy terrorist group who appear to be threatening bio terrorism on a large scale. This group, WEXA, the Western Exploitation of Africa, is determined to force Western companies to pay fairer sums for resources. They are prepared to use any means to do so. And in England, a woman turns up at Bagatelle gripping a business card of Nathalie’s. But she has never met Nathalie, doesn’t know her, and seems to have lost her memory completely. Who is she, and where did she find Nathalie’s business card? This is a good read, with an interesting premise, and a lot of solid plotting and story construction. What I did like about it was the overall plot. However, I cannot give this a five star rating, I’m afraid. There were two main problems for me. First was the quality of the copy editing. I have a real problem with grammar. I started making some notes on my copy of the book, but had to give up fairly quickly. The lack of commas, or use of commas instead of semi-colons and colons, soon became a real problem for me. Yes, I know I’m picky, and no, I don’t spot all the grammatical errors in my own books, but if you like clean text to read, you will notice it too. The second issue lies in the characterisation. The author is one who clearly feels comfortable with dialogue. A lot of the story is told by the leading characters, which is fine. However, at the end of the book I felt I didn’t really know Nathalie that well. I understood her work and professionalism, yes, but what made her tick, what motivated her, I didn’t feel I knew any better at the end than at the beginning. In fact, the same is true of all the main actors. I almost feel as if a good, strong plot was there, but the characters were forced to adhere to it at the expense of their own development. I’ll say it again: this is a good read. It is an interesting story, written by an author who clearly understands this theme and the environment of the production company. It’s just that for me it didn’t quite hit the buttons squarely.